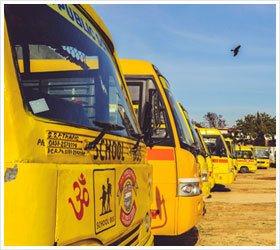 "An ideal transport system reflects the perfect work culture and ethos of the school"
Transport facility for picking and dropping the students nearest to their homes on specified routes is available. 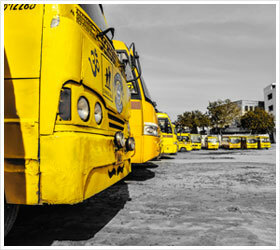 The students in the buses are accompanied by teachers and attendants to ensure their safety. 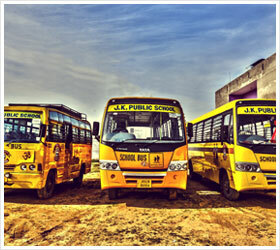 The transport in JK Public School is rated high on attributes like amenities, comfort, convenient routes, experienced staff and reasonable fares. Each bus is well equipped with water campers, medical kits and fire extinguishers. One phone on each route has been provided to every route in-charge for the convenience of the parents. ♦ Transport facilities are provided for the convenience of the students, although it is not an obligatory service of the school. ♦ Applications for school transport, transport cancellation, changes of bus stops, change of bus route etc should be submitted to the school Transport Incharge one month in advance. ♦ Buses will be available only on the routes and at stops fixed by the school and any request for new stops will not be entertained. However, the school reserves the right to make any changes if found inevitable. ♦ In case of misbehavior in the bus the teacher/driver is authorized to take immediate necessary steps and report the matter to the Principal/Transport Incharge for further action, if necessary. Such a student will be taken off the bus. ♦ The school buses are fitted with governors .There is a fully equipped first aid box in every bus. As you are aware the school will take every precaution for the safety of the children; however, the school is not responsible for situations beyond their control. ♦ Please ensure that under no circumstances, any parent boards the bus to discuss any concern .In case any issue is to be discussed, please meet with the school authorities.